We have heard many B2B business owners state loudly that Adwords only work for B2C companies. They’ve tried it, and it didn’t work for them. The stories of waste can be quite overwhelming. But is it true that AdWords doesn’t work for B2B companies? 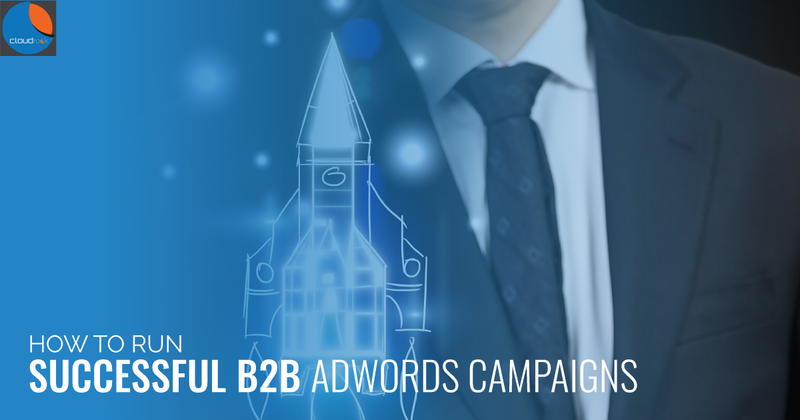 Here’s how you can ensure the success of your B2B AdWords campaign. It’s quite shocking that most B2B marketers don’t even know what CLV is, much less how to calculate it. Of course since you’re an avid reader of this blog, that’s not you, but just so we’re all on the same page, CLV stands for Customer Lifetime Value. Customer Lifetime Value is a “prediction of the net profit attributed to the entire future relationship of the customer”. And sure, we can understand that. There are several ways to calculate CLV depending on your industry, your business or your products. We’re not going into details here except to let you know that it is still both possible and important to calculate your company’s CLV. CPA is an acronym for Cost per Acquisition. It refers to how much it typically costs you to get a new customer. If you have managed any lead generation campaigns before, you should have some idea of your CPA on AdWords. If, like most of the companies we work with, this is your first time executing a lead generation campaign, then you may have problems calculating this. As a marketing manager, one of your duties is to evaluate the various channels open to you and decide which ones will be able to get you the most leads at the lowest cost. Most marketing managers will ask us, “How much is the typical CPA for our type of business?”. We would only know the answer to this question ff we have worked for one of your direct competitors before. More often than not, our reply would be, “We don’t know and you shouldn’t care for now”. Yes, you shouldn’t care how much other companies are paying for now. What you do need to care about is if AdWords can provide you with quality leads (with a good CLV) at a price that your company finds acceptable. You first need to show proof of results i.e proof that AdWords is a viable lead generating channel for your company. The best way to do that is to compare it with how much it costs to acquire leads and customers from your other channels (see why it’s so important to know your CPA?). 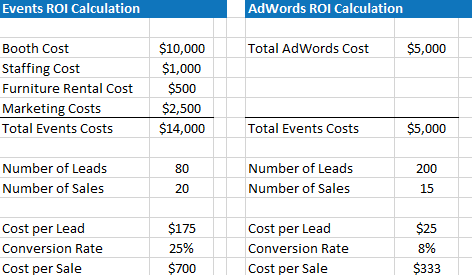 Below is a very simplistic comparison of your results from events and an AdWords campaign. If this is your first AdWords campaign, should it change your opinion if I told you that other similar companies are converting traffic to leads at $10 or leads to sales at $100? Firstly, you have just proved that AdWords can provide your company with leads. You have opened up a whole new marketing channel for them. Congratulations. Secondly, there are a host of factors that can cause these. Some may be AdWords related (account structure, copy etc) while others may not (branding, market perception, price). Thirdly, we will be optimising your campaign over time, thus improving your metrics across the board. It is important to optimise each marketing channel to ensure that we are getting the best results possible but for the first month, your emphasis should be on proving that you can get leads from AdWords. Lastly, and most importantly, it shouldn’t matter how much the ‘industry average’ is. It is a viable marketing channel as long as the CPA falls within the acceptable range for your business. If your CxOs are fine with spending $700 to get a sale via events, why would a cost per sale of $333 on AdWords be ‘too expensive’? There is a persistent perception among less digitally savvy CxOs that digital marketing should be ‘cheap’ or ‘free’. While I would agree that in general, digital marketing is more cost effective than more traditional forms of marketing such as billboards, it usually isn’t as cheap as what most CxOs have in mind. The best way to prove this is by using data. In this case, get your CPAs in order. Once you have your CLV and CPAs, you should work with your PPC or lead generation company to determine a realistic budget for your campaign. You don’t want to set a budget that is too high or too low. If you’re running campaigns on the search network, then you will be limited by the search volumes each month. If your budget is too high, you won’t be able to spend all of it each month. You will be wasting resources by letting your budget sit idle in your AdWords account when there are much better uses for it. If you set a budget that’s too low, then you will probably not get the results that you want. Let’s say that on any given day it takes an average of 10 clicks to get a lead, but your daily budget is only enough for 5 clicks a day. Then you may not even be able to get any leads at all. As we have mentioned, your first priority is to prove that AdWords is a viable marketing channel for your organisation. That means you need to prove that you can get quality leads at an acceptable cost as compared to other marketing tactics. The first few months is not about trying to spend as little as possible, it is about being effective. That’s a long topic on its own, but below are a few tips. This is critical not only in pay-per-click campaigns but in almost every other marketing campaign you engage in. You need to build your personas and get into the minds of your customers. What keywords would they use? What messages resonate with them? What objections do they need answered? Running ads that point to your website home page is one of the worst things you can do. Your ads should lead your prospects to persuasive landing pages that help to sell your products. As a B2B company, you have to be wary about targeting root keywords. For example, let’s say your company sells warehousing storage solutions, including shelves and racks. You should not be targeting keywords such as ‘shelves’ or ‘racks’! The majority of the people searching for those keywords will not be looking for shelves that you typically put up in warehouses. Place yourselves in the shoes of your target audience and think about the actual keywords they would use. Negative keywords tells Google which keywords you do not want to show up for. This is an especially important feature for B2B companies. No matter how well you research your keywords at the outset, you will find that a number of the search terms that your ads are showing up in are not relevant to you. You need to quickly block those out so you don’t end up wasting your money on such keywords. There should be a message match between your ad copy and your landing pages. If your ad copy reads ‘The Best Widget in Town’, your landing page should repeat and expand on the same claim. If your landing page messaging lies around ‘The Cheapest Widget in Town’, there is no message match and your conversion rate will take a dive. For B2B lead generation campaigns, your CPA is your most important metric, not your cost per click (CPC). Many marketing managers new to AdWords start off obsessing over CPCs. The metric that CxOs will care about is CPA, not CPC. If you’re Coke, you may want to show your ads whenever someone searches for ‘Pepsi’. This will help you ‘steal’ traffic from your competitors. Do note that while you are able to target competitor brands using keywords, these names should not show up in your ad copy. You should also target branded keywords to increase the effectiveness of your campaign. Yes, even if you are already ranking on the first page of Google for your brand name. Research has shown that combining both SEO and paid search leads to better results. Don’t get me wrong, AdWords has a ton of great features that every campaign should use. But it doesn’t mean that using any one of these features will lead to success. A successful B2B AdWords campaign is a culmination of many factors. Once you have proven that AdWords is a viable marketing channel, there are two general strategies you can pursue – (a) aggressively expand your AdWords activities to generate as many leads as possible provided that your CPA remains acceptable or (b) look for ways to become more efficient in AdWords by prioritising a reduction in CPA while cautiously trying to increase the number of leads.